August 6, 2014 September 6, 2016 Dr. Mama Esq. I want to write something poignant and meaningful. I want to offer some deep insight into the latest Israeli offensive against the occupied Palestinian people. I want to say something. All I can say is that I mourn for the mothers of Gaza. As a mother, I cannot imagine the pain of your child’s violent murder. That pain likely does not depends on whether the death was due to mistaken identity or intentional beef, a gang member’s gun or an occupier’s shells. It likely does not depend on whether the child is five or fifteen, boy or girl. It likely does not depend on whether the child is black or white, Asian or Latino. For a mother regarding her child, all that matters is that a part of her life is gone. The U.S. national news media seems to feel differently. Judging by their coverage, who the child is, or who he or she belongs to, matters in whether we should even be allowed to feel the pain of a dead child and mourn with their mothers. It’s long been know that the media suffers from what some call “missing white woman syndrome.” The symptoms include an overriding media concern when young, white, affluent women go missing, and the absence of such concern when the missing is old, brown, poor or male. When young, white, affluent girls go missing, hundreds of thousands of dollars are raised for information leading to their discovery, primarily due to the media coverage of their disappearance. Yet when young women of color go missing, for example, relatives may only be able to raise a fraction of that fundraised for white women, primarily due to the public’s lack of awareness and the benign neglect of national news media. We knew the names of every single child murdered in Newtown, CT, last year – as we should. We knew the names of Natalee Holloway, Caylee Anthony and Elizabeth Smart – young, female, and white – shortly after the time of their disappearance or murder. Their situations were universally framed as tragic. Their parents received hours of media time. Meanwhile the names of children murdered in Chicago dribble out here and there only when the story seems intriguing. And their parents are invisible. 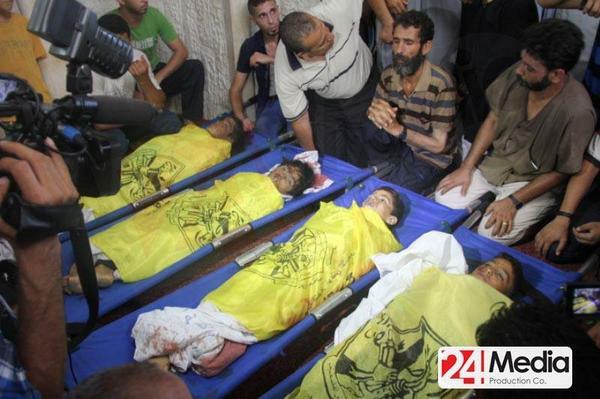 Hundreds of children have died in the past four weeks of Israel’s offensive attack in the occupied Gaza Strip. Their names have failed to reach us. While we knew immediately the details of the kidnapping and murder of the three Israeli teenagers that purportedly sparked Israeli retaliation, the names and detailed circumstances by which now 300 Palestinian children have been murdered by Israeli shells are elusive. Their mothers’ mourning is invisible. Ironically, it could be that the sheer number of deaths in the occupied territory of Gaza (1,834) so dwarfs that of dead Israelis (67) that U.S. news media finds it difficult to give space to all of them. That would be the most charitable explanation, but not as likely as the explanation that sees the deaths of brown Gazan children as somehow less “innocent” than that of three Israeli teens. I pray today’s cease-fire holds, and that politics end and humanitarianism begins. And as we breathe in the silence devoid of shells and rockets, I pray we hear the silence created by the death of Gazan children. I pray we hear the mourning of their mothers.